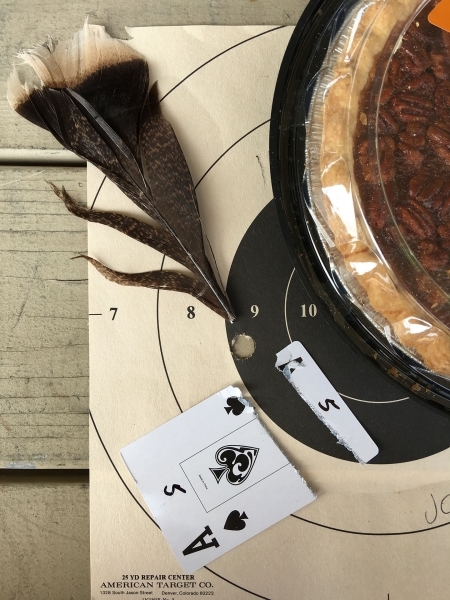 I have just started a new Thanksgiving tradition by shooting the annual Turkey Shoot match at the Richmond Rod and Gun Club in Richmond, Ca. 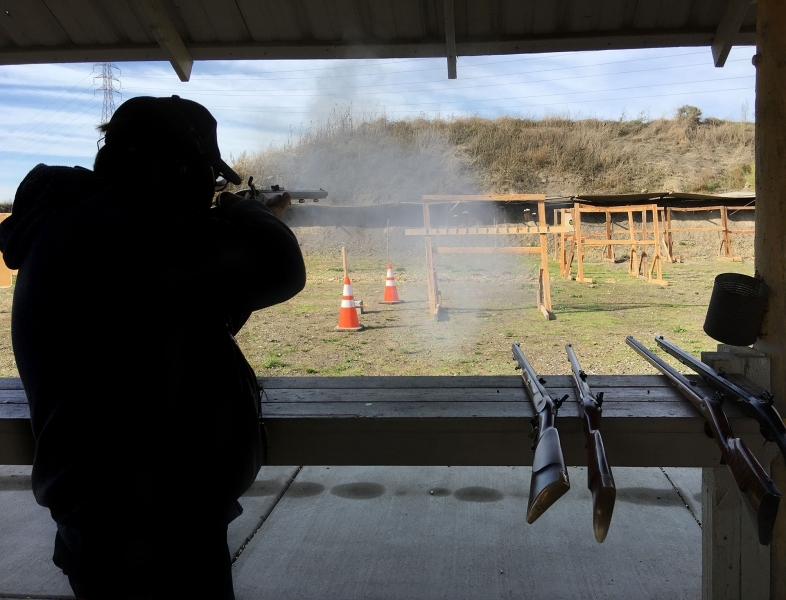 In this match, shooters use traditional round ball ammunition with black powder to compete for prizes donated by the shooters and local gun shops. This is not just another paper punching experience. 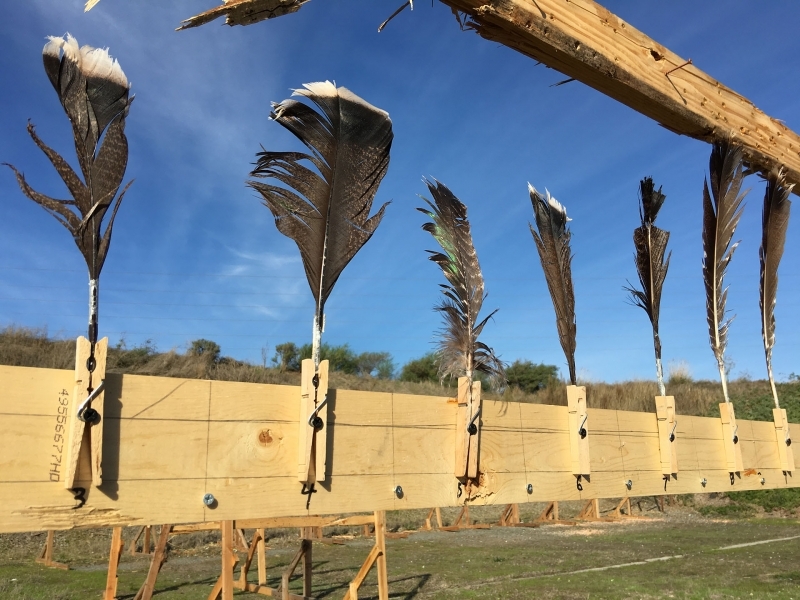 There are five target stations that present some very precise shooting challenges, even at their nominal 10 yard distance from the firing line. The first time I saw folks shooting this match a couple years ago, it added another reason why I should try a muzzle loading rifle. A couple months ago I purchased a used CVA Hawken muzzleloading rifle for cheap. One of the first thoughts I had was, Now I can do the Turkey shoot! 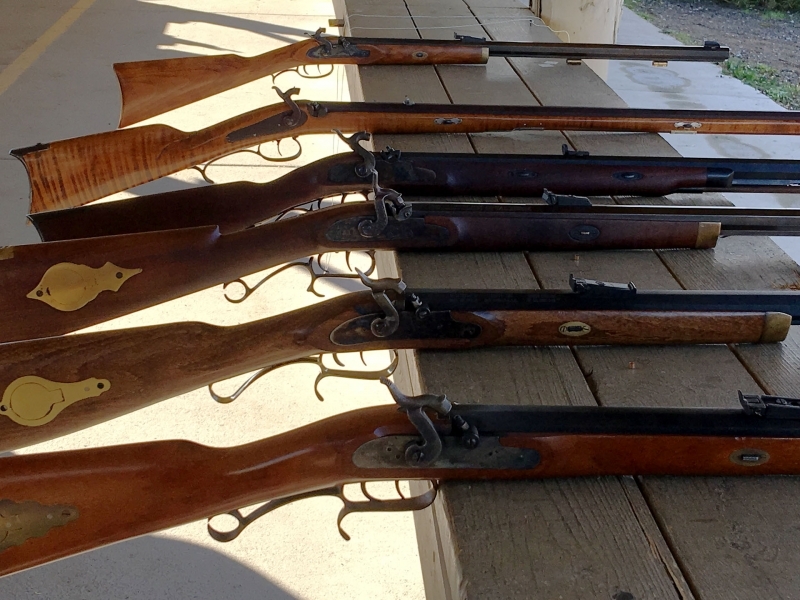 Seeing the handsome rifles brought to the event, I realized that a future build project may be a custom muzzle loader. I think the main principle of the tasks was “aim small, shoot small”. 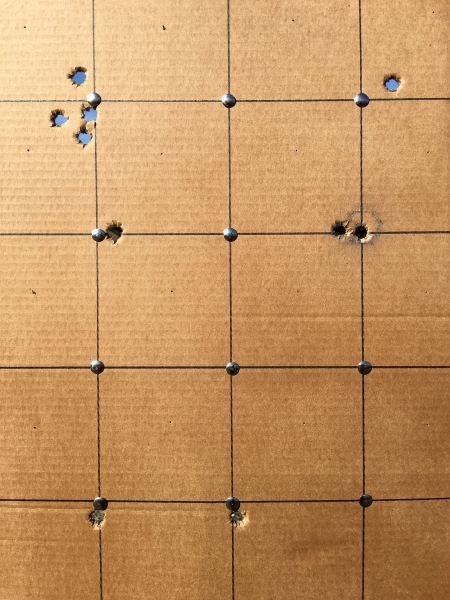 First up, the thumbtack grid: Shooters try to shoot the thumbtack all the way through the cardboard backing. 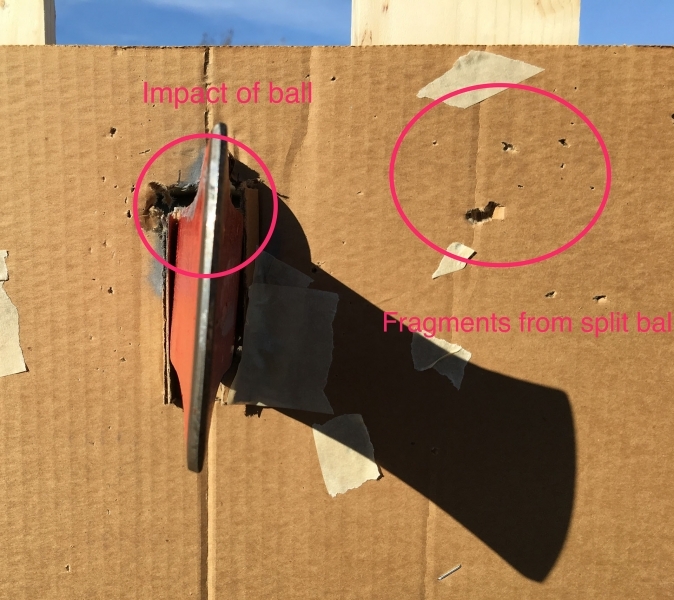 You are shooting about a 1/2 inch round ball at a 1/2 inch round thumbtack, literally, tack driving. Next was the ax head split ball challenge. The objective is to aim a ball at an ax head and split it on the sharp edge of the ax. Third up was “card splits”. 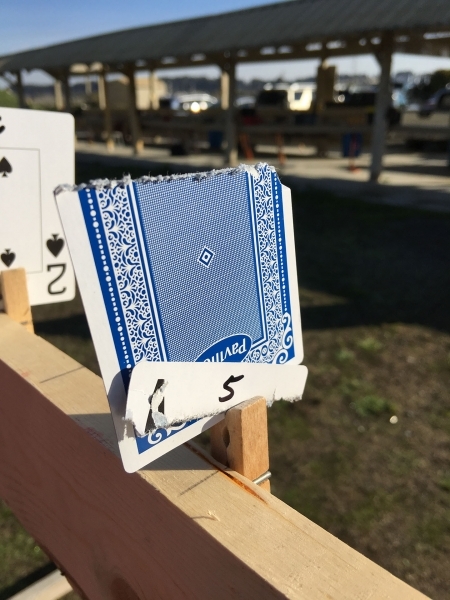 Playing cards were lined up on clothespins, _thin_edge facing the shooter. Splitting the card in two wins. Then, there was the feather challenge. Turkey feathers were placed in clothespins and the task was to split the feather in two along the quill of the feather. Finally, there was a moving bullseye target which descended down a wire. You needed to shoot the target while it was in motion, best scoring shot wins. How did I do? The only task I was not able to complete was the thumbtack shot. All but 2 of the events had a couple of shooters who made the shot. In these instances there was a second round to determine the winner. I made it into the shoot offs for the card split, the feather challenge, and axhead split. Since these were decided by shooting the thumbtack boards I was unsuccessful at those events. But I did win the moving target challenge outright. I took home a pecan pie and $20.00. Truth be told, 2 pounds of excellent Swiss Schuetzen black powder was the prize I coveted. But I was there because shooting stuff is fun, and I’ll be back. ← The smallest LGC meeting I have ever been to.